The Eurostars Residenza Cannaregio is a four-star inn just to the north of Venice's ancient Ghetto, in the quiet and pleasant neighborhood of Cannaregio. The residenza's 39 rooms and lobby have a modern feel by Venetian standards, with plenty of exposed plaster, wooden beams, and brick walls. Guests also have access to a large courtyard, where the hotel's buffet breakfast is served during the warmer months. The nearest airport-boat stop is at Madonna dell'Orto (a.k.a. "Orto"), where most Alilaguna Linea Arancio airport boats make their first stop between Marco Polo Airport and the Piazza San Marco. From the boat pier, reaching the Residenza Cannaregio is easy, with only one small bridge to cross. At the Madonna dell'Orto Canal, turn right and walk to the first bridge. Cross the small bridge and walk straight ahead, down the Calle Loredan, to the next canal. Turn right onto the Fondamenta dei Sensa and keep going until you reach the Calle dei Riformati, a narrow street that will go off to your right. Turn right onto the Calle dei Riformati. 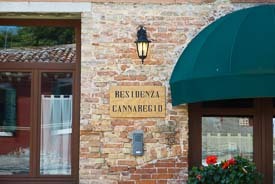 The Residenza Cannaregio's entrance will be straight ahead, before the next bridge.